To participate in the Divine Mercy Crazy Car Raffle, you must purchase a raffle ticket at $100 per ticket. You must be 18 years old to purchase a ticket. You need not be present to win once you have purchased a raffle ticket, however, you must keep your ticket stub in order to redeem your prize. The Parish will sell a maximum of 1000 raffle tickets. The Parish must sell 400 tickets before February 19, 2017. If fewer than 400 tickets are sold before February 19, 2017, then the raffle will not occur and proceeds will be refunded back to the purchaser. You must present your ticket stub in order to receive a refund. Should the raffle not occur, and proceeds returned to the purchaser, the Parish will refund tickets purchased within sixty (60) business days after February 19, 2017, but no later than May 15, 2017. There will be an early bird cash prize. To be entered as an “early bird” the purchaser must buy a ticket before 9:00 P.M. December 10, 2016. The winning ticket drawn for the $1,000 prize at the “Early Bird” drawing on December 10, 2016, will be returned to participate in the Grand Prize Drawing on February 19, 2017. Likewise, should other prizes be available at the December 3, 2016 raffle, those winning tickets will be returned to participate in the Grand Prize drawing. All cash prize winners will have a check made out in their name within ten business days of the drawing on December 10, 2016 or February 19, 2017. The first Ticket drawn at the February 19, 2017 drawing will be for the Grand Prize, second ticket drawn will be awarded the second prize; third ticket drawn will be award the third prize and so on until all prizes have been awarded. Prize winners must meet federal and state eligibility requirements, including proof of identification, social security or other identification required by law. This must be provided prior to issuance of any award or cash. 1099 Tax Forms will be issued to all winners and will be reported to the Internal Revenue Service and State Franchise Tax Board. Consult your tax advisor for deductibility of your ticket purchase. 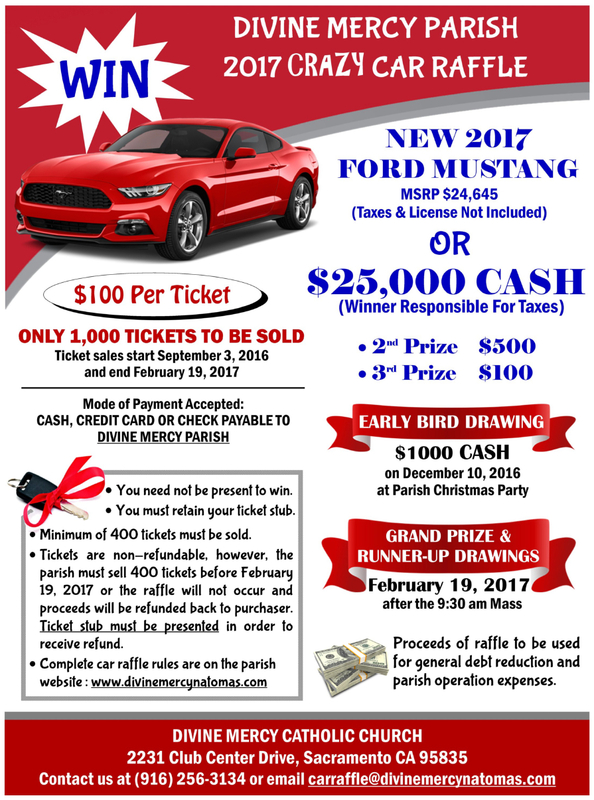 The Grand Prizewinner will have a choice between a new “basic” 2017 Ford Mustang V6 with a value of $25,000 or a cash prize of $25,000. Options or extra’s not included in the basic model, such as moon-roof, driver assistance mechanisms, enhanced sound system, chrome or mag wheels, etc. will be at the sole cost of the winner and are not included as part of the Grand Prize. Regardless of the Grand Prize selected, the winner will be responsible for all taxes, licenses and costs above $25,000. Any and all taxes, licenses, permits, inspections, delivery charges, etc. will be sole responsibilities of winners of any prizes offered in conjunction with the 2017 Car Raffle. Any decisions concerning eligibility, timing of purchased tickets for the early bird drawing, or any other procedural matters remain within the discretion of Divine Mercy raffle chair. All raffle results are final.